The national Amateur cup competitions have seldom produced joy for Horsham sides down the years, despite the annual belief that ‘this could be our year’. Despite reaching the first round ‘proper’ of the FA Amateur Cup at only the second time of asking, at the start of the twentieth century, more than thirty years would pass before our efforts would be eclipsed when Leavesden Mental Hospital ended our passage at the second round stage with a 6-2 victory. We would repeat that achievement just three more times during the competition’s existence, the first occasion coming the following season when a crowd of more than 2,000 watched us come unstuck on Barnet’s infamous Underhill slope as we gave the Athenian League side a fright before going down 4-2. Kingstonian needed two bites of the cherry to end our hopes in 1937/8 but these cup runs were the exception, rather than the norm, and it would be ironic that Horsham would have to wait until the final season of the FA Amateur Cup’s existence before reaching such modest heights again when Woking emerged victorious by three goals to two, having been held to a 2-2 draw at Queen Street the week before. The FA Amateur Cup competition ended when The Football Association abolished official amateur status in 1974. 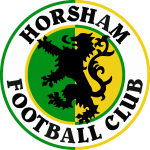 The following is a summary of Horsham’s progress in the FA Amateur Cup, detailing the opponents, score and round at which our run ended that season.